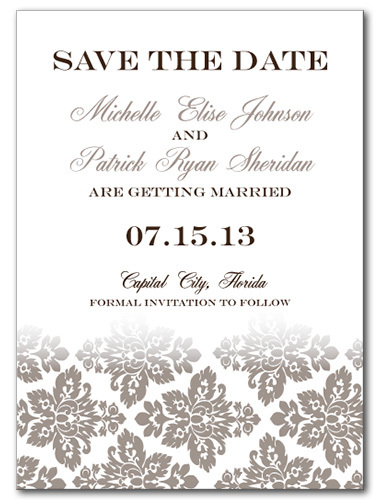 With the elegance of days gone by, these Victorian inspired save the date cards offer a stunning example of artistry. The romantic damask print at the bottom presents delicate detailing, while your choice of wedding font on a white backdrop creates any myriad of looks to enhance your wedding's theme. Choose from elegant and traditional, or go with a more daring font for a contrasting appeal to make it your own. Antique Damask For the best experience, we recommend personalizing your stationery on a desktop computer.